The Forest Conservation Policy was developed in 2011 in partnership with The Forest Trust (TFT) and since then SMART has focused on implementation of its many requirements, first on our own plantations and managed estates, and more recently throughout our supply chain. 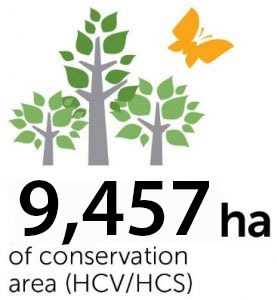 SMART committed to protect forests that included High Carbon Stock (HCS) and High Conservation Value (HCV) areas in 2011. Since then we have assessed our plantations and mapped 9.457 hectares from our own and managed as states which are now set aside for conservation. This helps us deliver UN Sustainable Development Goal 15 which aims to sustainably manage forests and halt biodiversity loss. With no development on HCS forests and HCV areas and peatlands, it requires us to engage with and respect the rights of indigenous peoples and local communities. This is underpinned by legal compliance and a commitment to demonstrable industry best practice through the achievement of national and international standards and certifications. Our commitment to forest conservation and no development on peat represents the biggest contribution we can make in avoiding GHG emissions which contribute to climate change. This is in line with UN SDG 13 on taking action to combat climate change. While we continue to complete and design our overall GHG emission reduction strategy, we have already instituted several emission reduction measures. Amongst other things, captured waste methane gas is used as an alternative energy source, generating electricity for our factory operations. We estimate that through methane capture and avoidance of fossil fuels, the methane capture facilities reduce between 40 to 55 percent of operational GHG emissions where they are sited. We have also built two biodiesel plants in South Kalimantan and near Jakarta, which will extend our product range to include the use of palm oil as a biofuel, and is in response to the policy of the Indonesian government supporting biofuel production. Together the two plants have a total capacity of 600,000 tonnes per annum. We are also particularly focused on working with the local communities in and around our concessions. We are involving the community in conservation efforts through inclusive approaches including Participatory Mapping (PM) and Participatory Conservation Planning (PCP). Through PM, The company and local communities map the land use in its concessions. The mapping allows all stakeholders to identify and designate critical areas for the community such as areas important for food security as well as conservation areas. This spatial plan is recognised formally and lodged with local authorities. The exercise also allows us to involve the community in conservation planning.